It’s Google Home Mini in mint! If Google has any secrets left for its Google Pixel 3 event that's slated for October 9, color us surprised. Today, Google beat the leakers by announcing a refreshing new color variant for the Google Home Mini it’s calling Aqua that will be out on October 29 for $49 (£49, AU$74). 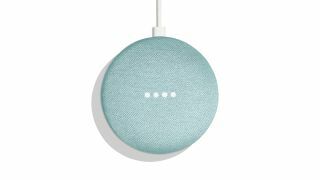 The mint-colored speaker adds a splash of color to the lineup of Chalk, Charcoal and Coral-colored Minis already on the market, but comes in at the same price. While it initially seemed likely that we'd get a refresh of the Home Mini at this year's Pixel event, it now seems more probable that we’ll instead see at least one new addition to the family of devices at the Google event next week – either in the form of a new first-party Google Smart Display device or the long-rumored Google Pixel Stand dock that turns your Pixel into a full-fledged Home device when it’s docked. In the last few weeks we’ve also seen a number of leaks about Google’s latest mobile device (with one or two of them even making their way into the wild) alongside a third-generation Chromecast that was sold accidentally by a Best Buy employee. With Google's October 9 event just a few days away, we won't have to wait very long to find out how many of these devices are really coming.